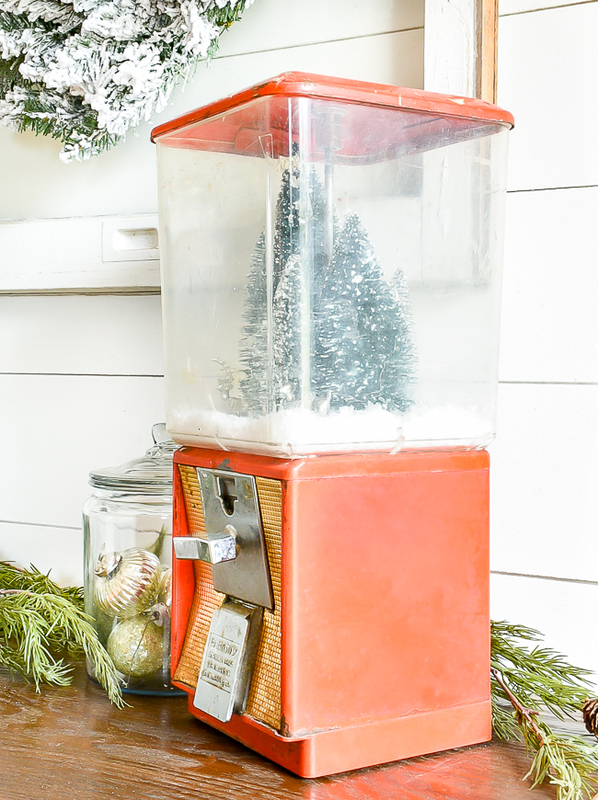 How to turn a vintage gumball machine into a winter wonderland snow globe! 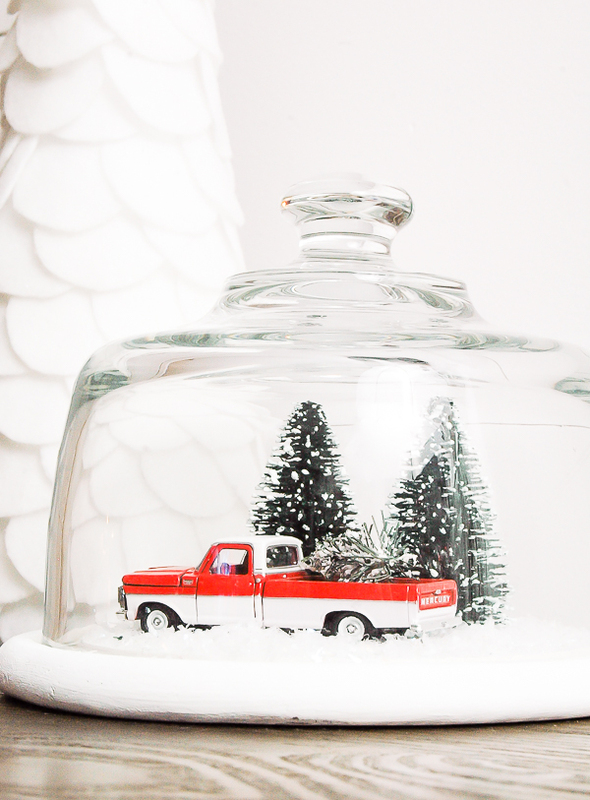 Turning gumball machines into snow globes is nothing new, but when I recently spotted a vintage gumball machine at a local auction I knew I had to make one myself. Ideally, I would have preferred a glass gumball machine, but when the bid went down to $5 I knew I had to snag it. After all, I did turn plastic Dollar Tree mason jar ornaments into snow globes and they turned out. 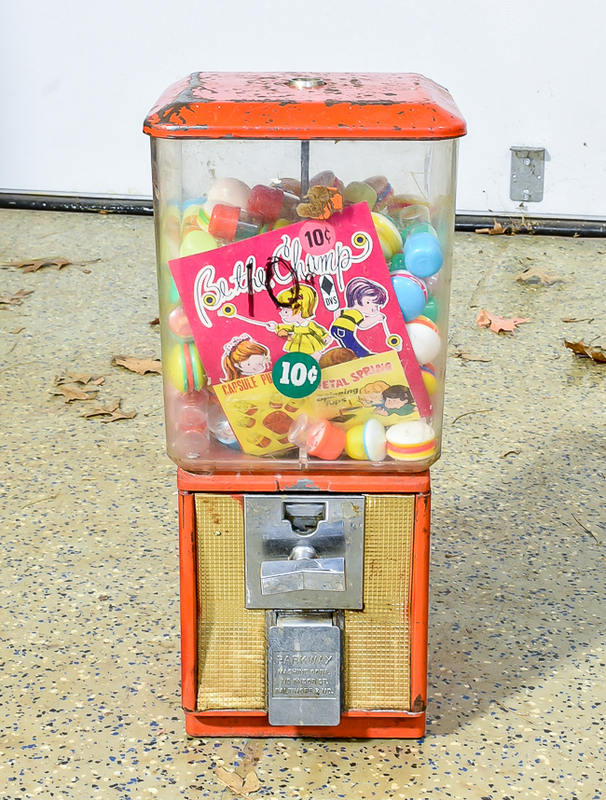 Plus, this gumball machine was red, old and had tons of character. 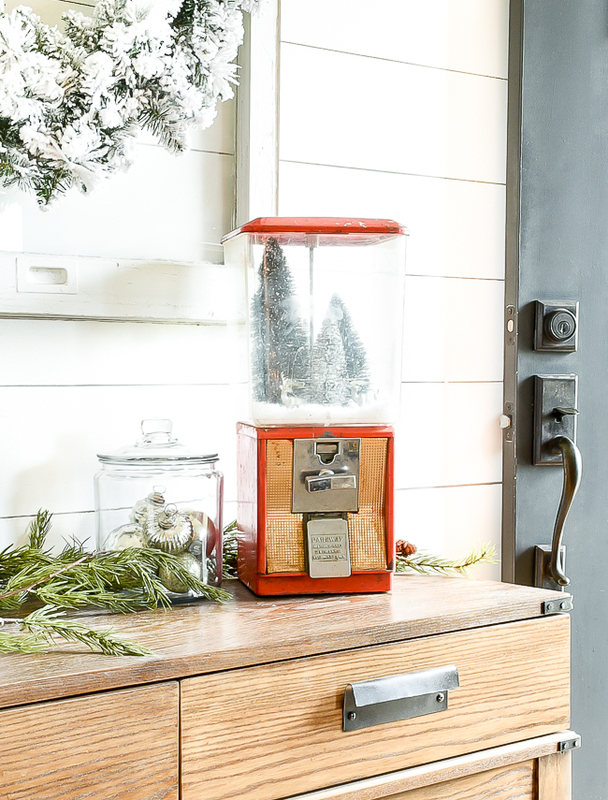 The perfect combination for making a fun DIY gumball machine snowglobe for the holidays. The first and most important part of turning a vintage gumball machine into a snow globe is unlocking the top and accessing the inside. Now, that would be easy if you had a key, but the odds of finding an old gumball machine WITH a key is pretty slim. I knew the one I bought didn't have a key, but I bought it anyway knowing I could figure out a way to get inside. There are many different styles of gumball machines with various locks and lock mechanisms. The one I bought had a lock and key assembly on the top, which connected to the down rod. 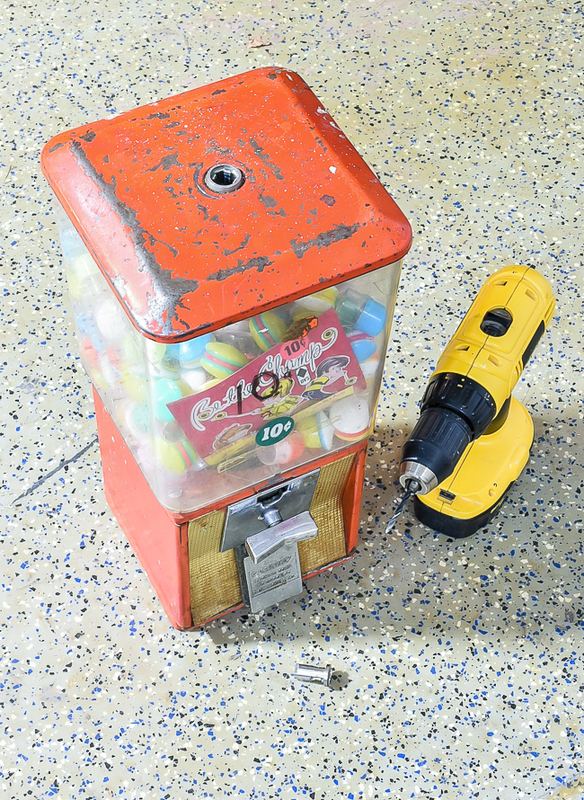 Getting the gumball machine open meant I had to drill out the lock. Using a 1/8" drill bit, drill directly down the center of the lock about 1/4". If you drill too far you'll damage the center rode that the lock attaches too. This would only really be an issue if you wanted to replace the lock with a new one. Switch to a 1/4" drill bit and drill into the lock until you break apart the internal lock parts. More than likely you'll need to drill further than 1/4" into the lock to break apart and destroy the lock. If the lock doesn't come loose, use a screwdriver to turn the lock counter clockwise. If you're still having trouble, try drilling a little further into the lock. Once I got the lock free I took apart the gumball machine and was pleasantly surprised to find a big 'ole pile of dimes inside! The funny part is, there was almost enough money inside to pay for the gumball machine. Score! I cleaned out the top then filled it with fake snow and winter accessories to make a winter wonderland. To avoid the snow from fall through the machine, I used poly fil to fill in the dispensing wheel and hopper. Then, I added fake snow, bottle brush trees and two little silver deer. 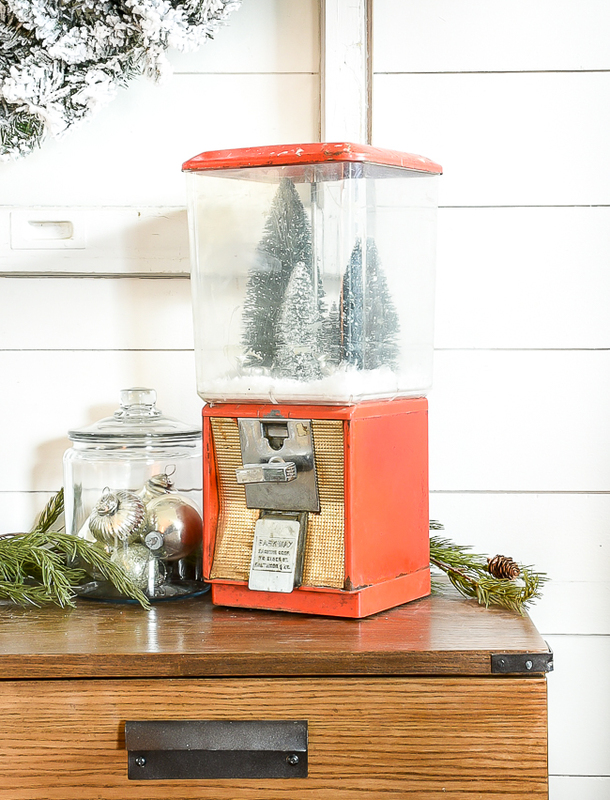 It would be easier to see the trees and deer if the gumball machine were glass, but I still think this vintage gumball machine makes the perfect snow globe. I ended up taking it to my shop and it sold right away. Now someone gets to enjoy this beautiful vintage Christmas decor as much as I enjoyed making it. I absolutely love the gumball machine project! I also like the mason jar ones too. I love your projects! You are so creative. What a clever and Christmas perfect "decoration". 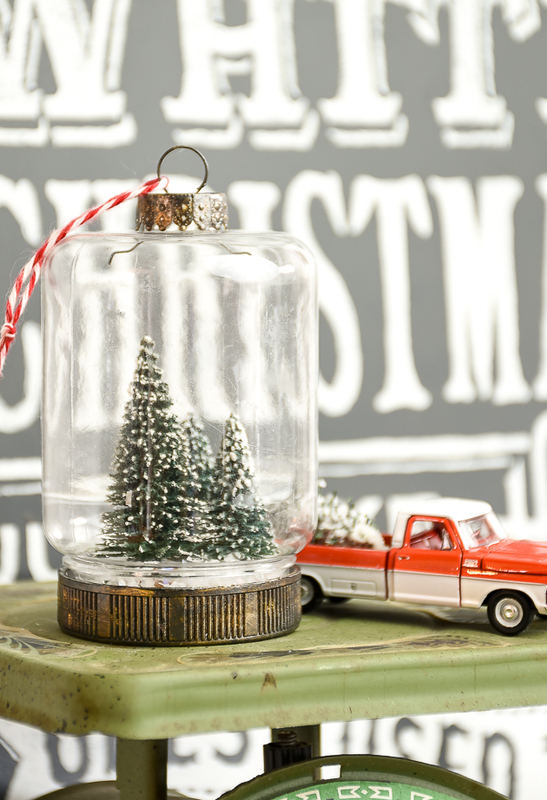 It keeps in step with this year's popular theme of the vintage red truck and Christmas tree. This is absolutely precious ~ I LOVE IT!! And I am not a bit surprised that it was snatched up quickly by a happy holiday buyer. Merry Christmas and in the Happy New Year, please keep your creativity and special items coming our way ~ always a treat!